Well, what a year! It's been a busy one at Backstitch HQ... and we're really looking forward to the next. In the reflective nature of New Years, we have an exciting event planned for January 2012. We have teamed up with The Sewing Directory to bring some recognition to all those hardworking sewing bloggers out there. 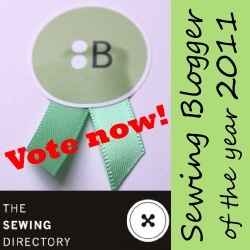 We would like you to vote for your favourite sewing blog of 2011, and we will reward the winner with £50 credit in the Backstitch shop to spend on whatever they wish! There will also be 2 runners up prizes plus one voter will be picked at random to win a prize too. How cool is that?! Everyone gets one nomination, so you will have to think hard about who has really inspired you this year. Perhaps it is a new blogger who is breaking ground or an old favourite. And, you never know, somebody may even vote for you... Gosh, I don't think I can take the excitement! 2nd & 3rd: Prize bundle including fabric pack, sewing book & handmade ceramic buttons. You can send your nomination using this entry form on the Sewing Directory website, or you can put your nomination on The Sewing Directory Blog or this Backstitch blog in the comments below our posts about the awards. Please do let us know why you love your chosen blog. We know you may have many sewing blogs that you love but I’m afraid we have to limit to 1 nomination per person. You have until midnight 31st January 2012 to get your vote in. Please do feel free to post about these awards on your blog to encourage your followers to vote for you. You can 'grab' the Sewing Blogger awards button using the code below, then your followers can go straight through and vote! One vote per person, multiple votes will result in all of that person’s votes being removed. All nominations must be received by midnight GMT on Tuesday 31st January 2012; winners will be announced on the 1st of February 2012. There is no geographical limit, you can enter from anywhere in the world, and vote for a blogger based anywhere in the world too. Postage costs for your order on Backstitch will be taken out of your voucher credit. The nominated blog doesn’t have to purely focus on sewing so long as at least 25% of the posts relate to sewing. In the event of a tie break we will use a random number generator to pick the winner. A voter will be selected at random to win the voter prize. I love this new range of fabrics. The prints are beautifully designed, and with such fun. They are seasidey, and kitcheny, and great for kids too. Hoodie is a Japanese American working for Timeless Treasures. Her collections are cute and kitschy with a style blended from memories of her childhood in Japan in the 1950s and 60s as well as inspiration from her current life in the United States. We have six of the prints in, and have a fat quarter bundle which we have named the 'Shark Bite'. Figgy’s will be releasing two collections a year, Spring and Fall, in the size range 18m to 8/9yrs. And, in Summer each year a baby line for ages Newborn – 12m will be released. The new patterns that have been released are really refreshing. There are two outfit sets and a Jacket, and we're really excited to have them at exclusively available Backstitch. Within the UK you will always be able to get Figgy's Patterns here first. ﻿Ayashe is a blouse and skirt set, there are two collar options to the blouse, two sleeve options and several hem options – you will definitely be making more than one of these blouses. The pleated skirt that completes the Ayashe set has deep pockets, and instructions for an ingenious way to insert elastic that can actually grow with your girl! The Nituna jacket is a swing coat that will make your heart skip a beat. Easy to put together and less time consuming than you would expect. The jacket has options for a fully reversible version with bound edges or a lined version. ﻿Sunki is a dress and leggings set. The pocket dress is brilliantly styled with great potential for contrast fabric highlights. The dress includes special pleated shoulders that give a lovely feminine touch. The leggings go together in a snap and before you know it you have an outfit. Figgy’s Patterns will be reprinting just two of their most popular patterns from the original brand, with the remainder of the ‘Patterns by Figgy’s’ out of print and in limited stock. I finished the Dead Simple Quilt top. It is HUGE. I did my quilt maths, I knew it was going to be 70" x 90"... look, it says so on my scrappy notes* (do your quilt notes look like this too?!) but, do you know how big 70" x 90" actually is? It is enormous. Here is a picture of said quilt top in the garden*. My husband is holding it up. It might be worth pointing out that my husband is 6'4" and is standing on a step... did I mention that this quilt is big?! I have to admit to not being a particularly experienced quilter, and so the prospect of quilting this bad boy is fearsome. Any tips for me?!! *please excuse the poor quality of these images. This post is not about beautiful lifestyle images but about the quantity of adrenalin coursing through my veins.